Location is beautiful right on the beach 200 baht if you can’t be bothered walking to local Karon for eating, hair braiding etc... and 400 baht to busy Patong! Although the hotel and its facilities are brilliant the hotel we felt was a little tired. On enquiry it was only built 8 years ago, however we thought it was a lot older than that. On the last day I treated myself to a facial in the spa located within the hotel, I feel like I had missed out it was so wonderful I wish I had done it more often... with the kids being entertained I had no excuse! I highly recommend this hotel to families. We had a pool room but the kids just wanted to be in the action waterslide, lazy river etc so the pool was never used! The people are friendly and very helpful! Beautiful resort which was lots of fun for us all! 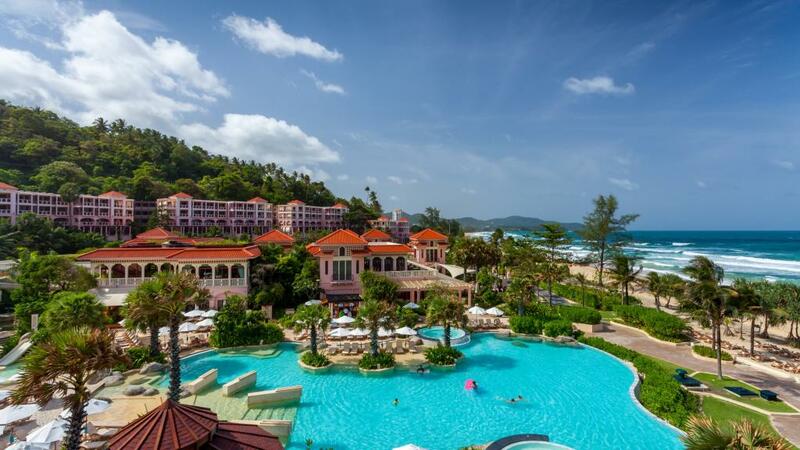 Centara Grand Phuket was a fabulous resort, with fun activities for all the family. Our room overlooked the adults pool, and had a plunge pool which was terrific for the kids. The variety of restaurants was good, and the service and quality of food was 5 star. Our kids enjoyed the Kids Club, and we made use of the gym, and the happy hour drinks by the pool every day. Highly recommend this resort for families looking for a great beach holiday. The service was impeccable. Rooms spacious and lovely. Kids loved the amazing pools with the waterslides and lazy river. location great, a few minutes walk into Karon Town by the beach. Easy taxi ride as well. Resort was amazing, a destination in itself. Beautiful beach front location with an amazing maze of pools and slides. A bit of a hike into Karon but otherwise the location was excellent. Only criticism is that they charge for absolutely everything. We have stayed at other resorts where shuttles to town, bottled water etc are part of the service. Otherwise it was fantastic. An amazing time was had by all four members of the family. It was a brilliant hotel in a beautiful location. Staff so attentive and they were so friendly. We have stayed here before and would choose it again in the future, if we are lucky enough to return a third time. We had a great combination of lazing around the pool, water slide action, day trips and shopping. It was just perfect. Thanks Centara Grand for everything. this was our second time & we enjoyed it even more than the first fabulous place, especially without kids & using the adults only pool. Easy location and lots of options eating on the beach and walking into Karon. Can't wait to go back again. Great place to relax. Ocean is crystal clear and resort staff are fantastic and can’t do enough to make your stay enjoyable. Lovely spot with rainforest and beach. Quite expensive as we couldn't take advantage of the 2 free nights if you paid for 5. Friends advised me that I would want for nothing when paying what we did, I did not find that the case! Felt like I was always handing out money. Stiilquite peaceful surrounds even though you are with hundreds of people. we had a great time. Service and facilities were great. Centara Grand - Fabulous location! Our Family really enjoyed the resort. It was on an amazing beach, close to Karon town which was not as crazy as Patong. Perfect for our family of kids ages 8 and 10. The staff are friendly, we had issues with our shower when we first got there, they had it fixed immediately which was great. Kids club had some interesting events for the kids. They especially enjoyed the Thai dye class. Overall we found it clean (for hotel standards by the beach), friendly, lots to do for kids. Great pools including a lazy river with 2 big water slides, a smaller sized slide, 2 cliff jumps in a 4m pool. Good access to drivers from hotel or an easy walk to front of hotel to hail a Tuk Tuk. This resort has lots of stairs. So if you are not fit, have health issues, or do not want to climb... then re think. Our kids were happy to clamber the 59 steps up and down several times a day. Consider it a work out !!! We loved this resort. even though it was full, it didnt feel crowded, there was always plenty of sun chairs. the kids loved the lazy river and the slides and the cliff jump - we had trouble getting them to leave the resort. Close enough to walk along the beach to go to Karon for dinner or massages but out of the way of the hustle and bustle. the beach was clean and uncrowded. The few small hassles we had (with regard to our room) were very quickly dealt with by management. we couldnt fault the customer service. breakfast was good. a nice selection of restaurants. the only negative was that the rooms are quite small (when travelling with children and trying to squeeze four of you into one room), but we booked a room with a large balcony and so had some extra space. We highly recommend this resort. Very happy with our accommodation. Great pool facilities and right on the beach. A small walk to the town but a little tricky getting there. Food at the resort was just okay. Nothing special. All staff were very helpful and friendly. Overall very happy with our stay. We stayed in 2 bedroom villa with private pool. We had 6 people in our villa including 2 young children and we were comfortable and it was very spacious. Very luxurious, the villa was perfect. The resort staff are amazing lovely people, always willing to help in anyway, always joking around with our kids and making them feel important too. They even checked in on us when they hadn't seen us all day to make sure we were ok. Very caring staff. The beds were so comfy, the resort was very clean with hand sanitizer everywhere. The gardens in the resort are beautiful, the main pool was amazing with swim up bar and pool side service, the slides and lazy river amd jumping rock gave us all hours of entertainment, so much fun, and again staff constantly on guard keeping it safe. We felt safe and secure in the resort at all times. Our overall experience was simply amazing, we could not fault anything. I did get sick whilst on holiday and the resort nurse came to see me and was amazing she gave me what I needed and was very caring. Other than this it was the best family holiday we could have had. Can't wait to go back again and miss being there already. What an amazing resort. We are a family of four with a 7 and 4 year old. We booked a room with our own private pool and it was sensational value! Where do I start... the breakfast buffet catered to all, even the fussiest of eaters gave it a work out! The pool, lazy river, water slides and jumping cliff were loved by all, we couldn't get enough. The swim up pool bar! The hotel was about a 15 minute drive to Patong and about a 10/15 minute walk along the beach to Karon. We loved our stay and would highly recommend! First time staying there, really enjoyed the experience. Great place , location and facilities. Fantastic resort for families. The pools are amazing with waterslides, lazy river & rock jumps. Beautiful beach, rooms & spa facilities. The spa centre is extremely professional. Food was excellent although dinner options within the resort was limited. Would definitely stay again. Overall had a lovely time at centara would have been better if it wasn't monsoon session as the unpredictable weather can effect your sight seeing and sunbathing intinerary . This is the second time that we have stayed at this resort and again found it excellent. The facilities were great. The whole family enjoyed the pool and the waterpark. My only criticism is that the twin beds were too small and the mattresses were very hard and uncomfortable. They also need to improve the activities around the pool. nice resort for kids. beach was a bit dirty. The pool with slides, rock jump ledge, lazy river, swim up bar was outstanding for the whole family! The rooms were beautiful ( however, the beds were the worst I've ever slept in in a resort) The view over the resort & ocean were magnificent! The staff were all very friendly & accomodating. While the resort has a great kids club and waterslides for the pools, the lack of proper internal connecting rooms made the stay difficult. I had to stay with one child and my wife in the other room with the other child as they are too young to stay on their own without an interconnecting room. Had a great time. Room was very nice. Resort had everything we needed. Right on the beach which was very unique. Perhaps the only detractor was some areas of the resort that had some bad smells when you walked past. One of there areas was near reception and the other was behind the kitchen. They should try and do something about this because those smells were bad. Great pools. Kids had a ball. We stayed in the 2 bed villa which was amazingly spacious, however the bedrooms were really dark and the lighting was very frustrating as we could not seem to get all the lights to work or work consistently. Also the air conditioning was too high and was freezing in the bedrooms, could not seem to turn it down only off. Wireless was virtually non existent. We had a lovely villa right near the beach, it would have been lovely to see the beach if the plants could have been trimmed in front of our pool. Service in the resort was great, food was just OK.
Hotel good. Close to everything, 10mins to Patong Beach . Pool nice but rooms look a little tired. Air con played up resulting leeking water everywhere, had to move rooms. Breakfast was good. Facilities were great. Travel online offered great price. Would consider staying again for good price. There was one pool where every spa button and jet buttons did not work on every single section. The spa in room 741 leaked water (rusty water) on the floor and its blower did not work so you could not have a proper spa which was a shame as we upgraded to this room to include the spa. We also informed the front of staff on checkout room 742's air conditioning cuts out when you turn the spa on. Other than that the staff were friendly , helpful and always smiling. The location is great and the beach is clean. Whilst this is a five star in Thailand it would be 4 star in Australia. This is our 2nd trip to the Centara Grand Beach Resort. It's an excellent resort for families with lots of stuff to keep the kids entertained. Rooms are excellent and if you can afford it the Pool Deluxe Rooms are worth the money. We arrived to find out our room had already been booked. We moved room 3 times in our 12 day stay. They did upgrade us to a better room only after some convincing however the day we moved into the room we could not access the room. They did make a big effort to make to fix the problem hence why I have been generous with my star rating. Initially we were extremely disappointed and frustrated but they did do their best given the limitations and challenges with a booked hotel. This holiday was celebrating my friend's 60th Birthday and we couldn't have picked a better destination. Away from the hustle and bustle of Patong yet close enough if wanting to go into Patong for the occasional visit. The staff were friendly and always helpful . "Beer" at reception arranged a birthday cake for us as a surprise for my friend . It was delivered on time with candles and a birthday message a really nice touch. "Jum" from housekeeping was a gem . Always smiling , happy to chat to us about our day and at the end of the day delivered ice to our room for us to enjoy a cold glass of wine. "Olga" the Maitre d at The Cove was helpful , friendly and added to our dining experience having a chat when time permitted and getting to know us. The resort is located in the cove about 10 minutes beach walk from Karon. The beach in front of the resort is kept clean and has a life guard on duty. The Resort has many dining options all with excellent food and service . A well equipped gym is open 24 hours a day which I took full advantage of. There are water slides and tube riding for an extra something to add to your holiday experience. Although the resort was fully booked , at no time did we feel overcrowded . The resort is well laid out giving you the option of as much privacy as you wish to have at given time. This resort offers a little extra than many resorts I've stayed in in Phuket . I can't wait to visit again. This resort is ideal for families , couples and friends. The rooms were comfortable as too was the bathroom. The restaurants offered good choice and service. But be weary of the 17% tax on everything at the resort. The food at Karon (15 min walk along beach) offers a great selection of food , slightly cheaper and with no tax! Highly recommend for a family getaway, with friendly and helpful staff. The views from the hotel were beautiful and the pink buildings were gorgeous. The room itself was ok but nothing overly special. The location in terms of beach access is great but not if you want to be close to shopping and restaurants. The quality of the food at the hotel itself is good. This was our second trip to Centara Grand Resort Phuket and our stay was just as good as the first time. Fantastic staff, amazing resort - will definitely be returning again and again. We had a great stay at this resort. The facilities were superb for my family - from the rooms, to the breakfast dining hall, the kids club, the swimming pools, the lazy river, the water slides, the diving pool and great access to the beach. Great family resort on the beach. Close to Karon and Kata but a little further away from Patong. Amazing hotel amongst the lush green rainforest. Fantastic family resort with so many water activities to keep the kids entertained. Food was excellent, rooms were very spacious and a perfect quiet location but still close to Karon shops and short tuk tuk ride into the centre of Patong. A fantastic resort for families. Heaps to do for the kids. Multiple pools, awesome kids club, water slides and activities. The service was outstanding. The rooms are a little dated but clean and functional. An easy 10 minute stroll down Karon beach to the shops. A great holiday and a great place. Our kids had so much fun at the waterpark and the walks on the beach were beautiful. Enjoyed staying here, as there was so much for the kids to do. The eating out options were great and resort itself definitely had that 5 star feel about it. This is a great resort for families with children. The water slides and jumping rocks kept the kids entertained for hours. Life guards patrol the area all the time so you know your kids are being watched whilst you can lounge around by the pool. The kids club is also awesome with a games room for the older kids and special art activities offered daily. Our kids had a ball which meant we had a relaxing time too. For the couples there is also an adults only pool if you'd like to get away from all the families. Overall, happy with our room - worth getting a premium spa deluxe, we had amazing ocean views. Ask for one closest to the beach! Service around the pool could have been a little better but generally good. We loved the Italian restaurant for dinner and the Cove also had an extensive a la carte menu plus different themed buffets every night. Half board was the way for us with kids but there are plenty of restaurants to choose from in Karon and Patong but you would need to organise a taxi. spent 17 days here and had a wonderful holiday. restaurant food prices are expensive but we spoilt ourselves for this holiday. Thanks to Centara Grand Beach Resort this was the best holiday we have had. This resort was divine and we can't wait to get back there. The resort located on the beach, had fantastic food (the best buffet breakfast I have seen - even better than the Westin), the evening dinners with live dancing entertainment, including buffets were also beautiful, the food was fresh and there was no stress of food poisoning. The resport also provided free clean drinking water. I loved the day spa as it was even at a higher standard than Aurora in St Kilda, Melbourne. The kids loved the kids club, the room was large and spacious and the activities for the kids we very exciting, including nail painting and hair braiding and movie nights. The lagoon pools were splendid, we all loved the pools, the floating river, the huge cliff jumps, the toffler slide, the swim up bar, the spas, the speedy water slides, we never wanted to leave the pools. Our room was also very clean and comfortable, for a family i highly recommend the rooms with the spa on the large bacony. The location of the resport was also very good, my husband and i took lovely runs along the Karon beach path. I think that if we didn't stay at Centara I wouldn't be reporting as good a holiday. If you want the best service for the whole family, this is the place to stay. This was our second stay, and will go back again without any hesitation!! What a great stay at Centara, highly recommended. Staff were so friendly and genuine. Location was perfect, food was the best. Very friendly atmosphere with good facilities.